He saves a kitty, the pope (who sounds a lot like FZ), Ren and Stimpy, the President, and the U.S. Constitution and the Bill of Rights! It’s… Powdered Toast Man! Frank held the album with both hands and glared at it with his beady, black eyes. Clouds of what looked like dry ice vapor seemed to be coming out of his ears. 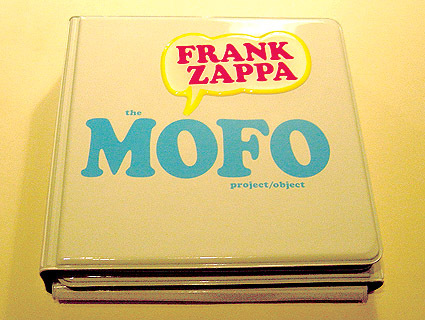 “Mistah Zappa wanna buy that record from you,” Smothers rasped in my ear. “That’s a really great album, Frank!” my clueless, yet status-seeking friend remarked. “How much ya want for it?” Zappa monotoned. There were traffic jams! All that holiday food! The presents! There was a leak in our water pipes! A postal worker robbed me of ten euros! So um: no Friday Boot today — although last week’s offering will remain online until the next. Happy Holidays! the “Bill Loses It” show also serves as a reminder of how much has changed since 1989. If Hicks had given this performance in a post 9/11 America, he would’ve faced far worse than Michael Richards did when he lost it onstage. Hicks might’ve been deported or jailed. The 4 Disc MOFO arrived this morning at around 8, when a postal worker rang the doorbell saying he had a special delivery. Standing in the doorway in the freezing cold waving an oversized package at me, it soon became clear what was special about it as far as the post office was concerned: a 10 euro customs fee needed to be paid. Doctor Sharl and I proceeded to dig out what coins we had left — it took a mere 10 minutes — upon which I was granted The Package. On this Christmas Day, The Godfather of Soul has died at the age of 73. Take it to the bridge Mr. Brown! You shall be missed. Yes, ladies and gentlemen, Barry will do anything, and I mean ANYTHING to keep you online this Xmas. Ho Ho Ho! Is There A Hungarian In The Audience? Robin Slick, published novelist, raging liberal, and mother of 2/3 of “the Adrian Belew Power Trio” asks: Okay, Who Knows Hungarian? Why that’s a job for BalintMan if ever I saw one! A classic line-up, some classic tunes: Durham, NC, 24 February 1973 — get it while it’s hot! Banished Words List 2006 Ed.